We are grieving the death of Janet Murphy on June 30 at home in Liverpool, NS. Born June 19, 1934 in Halifax, Janet was the only child of the late Charles and Mary Roper. She will be dearly missed by her husband Dr. Bill Murphy; children Karen, Jon (Holly), and Lisa (Geno); grandchildren Mike (Heather) and Ben. There will be no visitation or service at Janet’s request. Memorial donations may be made to a charity of choice. 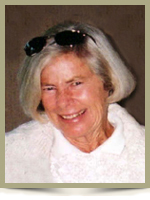 Offer Condolence for the family of Murphy; Janet R.
Sincere sympathy to the Murphy family. My thoughts are with you . Sincerely Brenda Lawrence and Jim Hubley . Bill and family, we were so sorry to hear about Janet,so passing. Please know you all are in our thoughts at this difficult time. Dot and Doug. Bill and family: We are so sad to hear the news of Janet’s passing. Janet was such a kind, warm person who loved to have a little chat whenever we met her. Please know our thoughts and prayers are with the family at this difficult time. God Bless. We would like to extend our Deepest sympathy at this very difficult time. Her friendly smile and laugh will be missed. I am so very sorry to hear that Janet has passed away. My sincere condolences. Dear Bill and family: We are saddened to read of Janet’s passing. Her smile and kind words will be remembered by many. Take strength in knowing others grieve with your family. Our thoughts are with you all at this difficult time. Sorry to hear of your Moms passing, keep your memories close they help in the difficult times ahead. Sympathy to you Bill and your family. Remember seeing her on the golf course on occasion. She will be missed. Lisa & Geno and family, How very sad to hear this news this morning. You were of great comfort to me last year when my mum passed away, and I hope my family and I can offer the same for you. My condolences on this great loss. I was saddened to read of Janet’s passing this morning and so hasten to express my deepest sympathy to you and your dear family. Although I haven’t seen Janet since her mother was in Melville Hts., Janet has often been in my thoughts, especially when I remember the happy shared experiences growing up on Poplar Street. Janet was a wonderful “big sister” to me and spiritual heart of the old Poplar St. Gang. As the oldest child in our small community, she planned and directed all of our rainy day concerts. The Stoddards, Carters, Doreys, and Parkhills will never forget your Janet, our very good friend. I know how I felt when I lost my mum last year, and we’ll both be thinking of you as you bear this. We didn’t know her well, but she seemed a really nice lady on the few occasions we met; full of fun, just like her lovely daughters. Karen, Lisa, and family. Our sincere condolences on the loss of your Mom. Our thoughts are with all of you. Rest in Peace Mrs. Murphy. Robert and I were so sorry to read of Janet’s passing. She was a lovely person and always had a smile. This has been a rough time for you Bill, having just lost your sister, Ruth. We played basketball together and I always enjoyed her on and off the basketball court. Our thoughts and prayers are with you all at this most difficult time. so sorry to hear of Janet’s passing. our thoughts and prayers are with you all at this difficult time. Bill and Family – How sad to read of Janet’s passing. Our memories extend from Nova Scotia to The Meadows and those fun filled Sunday golf games. Janet, her smile and sense of humor will be sorely missed by all those fortunate enough to have known her. I want to express my sincere condolences on the passing of your wife, mother and grand mother. Liverpool has lost a great suporter and citizen . My thoughts and prayers will be with you in these difficult days. Bill,Karen&Lisa,So sorry to hear of Janet’s passing,I always enjoyed our little chats at the grocery store.she was a positive lady.Will be missed by the whole communityOur thoughts and prayers are with you. So very sorry to hear of your loss. Mrs. Murphy was always wonderful to me. Take good care of each other – and know others are thinking of you at this very difficult time. Sorry to hear of your mom’s passing. Remember the good times. Denise and I were saddened and shocked by the loss of Janet, and wish to extend our deepest condolences to you and all the Murphy family. I will cherish the memories of our visits to Liverpool and of Janet’s friendship and hospitality and particularly enjoying her seafood chowders during the lunches shared. I was so very sorry to read of Janet’s passing in this morning’s paper. She always had such a nice smile and cherry word whenever we met. I know she will be missed very much by all who knew her. This must be particularly difficult for you Bill, having so recently lost your sister. Please accept my sincere sympathy . Our thoughts are with you at this time. Janet will be missed–we certainly missed her at our morning coffee klash. Bill, our thoughts and prayers are with you and your family. Janet was a class act. wonderful, gentle person who always took time to acknowledge me no matter where we met. Recently we met at the grocery store and she continued to be her pleasant and cheerful self even though she was ill.
She will long be remembered, and kept in our prayers along with you Bill and all family members. So sorry to hear of Janet’s passing ,she was a great lady and will be missed by all who knew her. We will always cherish the memories of the many good times we have shared over the years. Janet’s good humour and wonderful personality made them all that much more special. We will miss her dearly. Florida will never be the same without her. Sincere condolences to the Murphy family. May your memories bring you comfort and may God bless. Please accept our sincere condolences. Our thoughts are with you at this time. We are both saddened by the news of Janet’s death. There are so many memories you have accumulated over the years, cherish them deeply as you mourn the loss of a special lady. I was sorry to hear about Janet’s passing. She was such a good friend to my mom and they shared and supported each other so much though their wonderful lives in Liverpool. The Bell’s and the Murphy’s certainly shared many wonderful times together. Especially many magical Christmas Eves. My thoughts are with you all! Marj and I were saddened to read of Janet’s passing. You have suffered a very real loss. Please extend our condolences to your family. Very sorry to hear about Janet’s passing. I always enjoyed talking with her whenever she came into the shop where I worked in Liverpool. She was always so interesting, so friendly and so full of energy. I will miss seeing her. My sincere condolences to all of her family. Janet and I grew up together on Poplar street and as I recounted to Henry Roper this monrning we were playing ball on her chimney when her dad popped around the corner to tell uf Roosevelt’s passing. We cried our 12 year old tears together. y condolences from both ED and me to you all…bless you. Please except my Deepest Condolences on the passing of Janet. We use to have such a Lovely talk when she came into Sobey’s for her Groceries, I truely Loved waiting on her!!! What A Beautiful Lady she was!!! Keep all those Beautiful memories tucked inside your Heart for that is where she will Truly Be!!! God Bless Each & everyone of you. May she now Rest In Peace!!! Our condolences to you and your family at this very difficult time. My heartfelt condolences at this sad time. I am so sorry to hear the news. Even though we knew this was coming, it is never an easy thing to face. My deep condolences to Bill & the Family. Janet’s wonderful personality was infectious, and I always looked forward to her company over the years. She will be missed. We were saddened to learn of Janet’s passing. She was such a warm, friendly person. Our sincere condolences to all the family. When I read of Janet’s passing my thoughts went back to happier times.You and your family are in my thoughts and prayers. I am so sorry to hear of your loss. Your Mom holds a a high place in my fond memories of time spent at your home. Lots of love to you all. Please know that our thoughts and prayers are with you and we hope they will carry you through this difficult period. We know your Mom will be greatly missed. So sorry to hear about your loss. My deepest condolences. Sorry to hear about Janet. Condolences to you and your family. My condolences Karen to you and your family. I feel for your father it is never easy to loose your partner, my prayers are with your family. Dear Bill & Family :: We are so sorry to hear of Janet,s passing. She will be sadly missed by all who knew & loved her. May you all remember all the wonderful times & all the happiness.you enjoyed together. Lloyd & Barbara . Bill and Family, so sorry for your loss. A lovely lady, our thoughts and prayers are with you. Was so sorry to read of your wife’s and mother’s passing. A long time ago, Dr. Bill, you were David’s dentist and kindly took me on when we were married. We never forgot you and, although David is now gone, I just couldn’t let this go without letting you know how sorry I am. May God’s comfort surround you and give you peace. It was with great sadness that we read about Mrs. Murphy’s passing. Sending our sincere condolences and prayers to your family. I am so sorry for your loss. My deepest sympathy goes out to all of you. Our condolences to you and your family. It is always a shock to lose our mothers; they are the cornerstone of the family. Our prayers go with you and your family at this time. Very sorry to learn of Janet’s passing. We have happy memories of our many Friday games in Sarasota, and of the subsequent celebrations. Dr. Murphy and family, please accept our condolences on Janet’s passing. She was a warm and lovely lady. We passed often at the Post Office Corner where she always had a friendly word. May your many memories bring you comfort at this sad time. Bill…My deepest sympathy, I know how you must be feeling at this time and my prayers will be with you and your loved ones. Always looked forward to Janet returning from her winter vacation to join us for our morning coffee. She was such a friendly lady and always had a smile and very pleasant. We have missed her. Our memories of Janet are so special, particularly her joy and energy whenever we were around her. Our family feels very blessed to have met her. Sending our condolences to you all at this hard time . May you find peace in the light of her memory. Our thoughts and prayers are with you all…..she lives on through her family.